If your lawn is looking thin or bare, it might be time to aerate and sow it with a layer of grass seed to restore it to its lush, green state. The cool-season grasses of Indiana fare best in earl spring or the fall when the air is cool but the soil is warm, giving grass a few months to grow before summer or winter comes around. 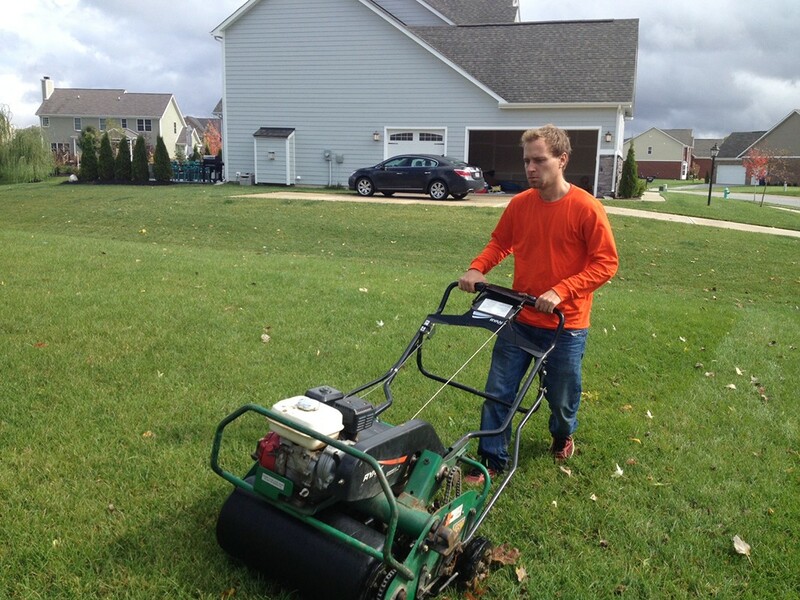 Read on to learn more about why fall is the best time to reseed your lawn. Why Early Spring of Fall? In Indiana, early spring or fall is the best time to sow grass seeds and aerate for a number of reasons. The moisture and warm air are beneficial to grass growth in the spring. Seeding and aerating early in the spring before the summer’s hot temperatures and drought conditions reduces undesirable stress to your new lawn. There are a few things about spring that make it less-than-ideal for reseeding than fall. Weeds are more prevalent in the spring, which causes grass to have to compete for the nutrients it needs to thrive. We recommend a second aeration and seeding in the fall to combat these issue if needed. Seeding and aerating in the fall allows cool-season grasses to establish before the winter. Try to sow two months before the first frost of the season. There are fewer active lawn diseases in the fall, weeds tend to taper off, meaning your grass won’t have to compete as much for access to sun and water. Sunlight begins to increase during fall as the tree leaves begin to drop. Moisture is key to growing a healthy lawn of grass, making spring the second-most popular (but less ideal) season for seeding. Fertilize: help your lawn develop a healthy root system by applying a seed-starting fertilizer with a fertilizer spreader. Your friendly neighborhood lawn-care professionals at GreenLawn by Design are here to help you reseed your Hamilton County lawn. Contact us today at 317-804-8088 for a free consultation to make it look healthy and full again.